Hanoi (VNA) – Deputy Prime Minister and Foreign Minister Pham Binh Minh visited the Lao Embassy in Hanoi on April 11 to extend his greetings ahead of the Lao traditional New Year festival Bunpimay. 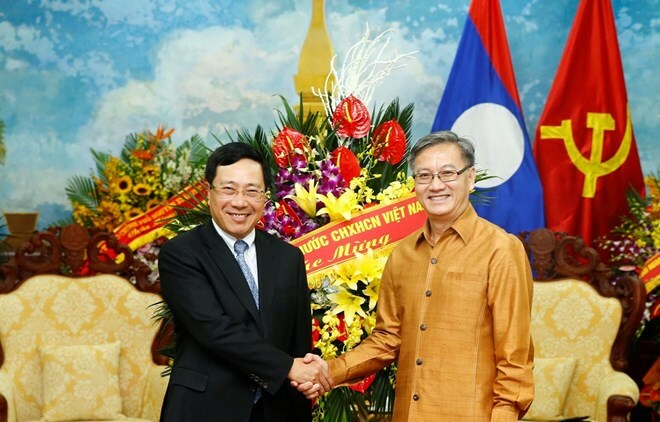 At the visit, Minh expressed his delight at thriving Vietnam – Laos ties and regular visits between their high-ranking leaders. He mentioned the recent visit to Laos by General Secretary of the Communist Party of Vietnam and President Nguyen Phu Trong, saying it helped boost bilateral cooperation.